Pina Juice Terbuat dari nanas kualitas terbaik dan berkualitas tinggi dari perkebunan PINA dan petani lokal bidang yang dikombinasikan dengan juice nanas asli dari buah yang fresh yang diambil dari perkebunan milik sendiri. Produk ini penuh nutrisi yang akan membawa kesegaran yang belum pernah Anda rasakan sebelumnya untukmu dan keluargamu. We were founded in 2016, as a business expansion of our holding group (the company has been involved in Indonesia's development since 1995). Currently, PT. 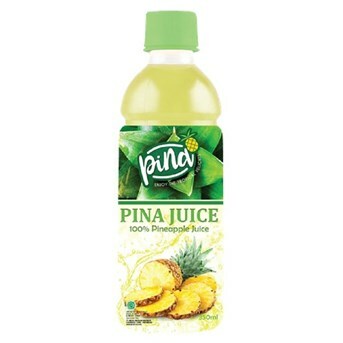 IBM has business in fresh pineapple plantation and Canned Pineapple Manufacturing. We have a vision to be a leading agribusiness company that keep continue to grow progressively in Indonesia. Our mission are to continuously make innovations in developing and processing the horticultural product, to creating valuable jobs for Indonesian as many as possible, to create sustainable collaboration with local farmers, and to be a good corporate citizen. We have commitment to uphold the highest quality standards for our quality operation management and food safety. We implement ISO 22000: 2009, Good Manufacturing Practices, Hazard Analysis and Critical Control Points, GAP, Halal, MD BPOM RI and Pesticide-free. Our operations sites are located in two areas in West Java. The largest pineapple plantation is located in a city in West Java, which is also known as The City of Pineapples in Indonesia. Meanwhile, we also have manufacture sites located in West Java, which supported by high technology for the canning process. West Java region is standing side by side with Indonesia's capital city, Jakarta and that makes our access easier to the port and International airport, which can be reached in a few hours. Currently our plantation is planting the Smooth Cayenne Pineapple. We use the high density cultivation method that makes our agricultural land more productive. In management, we use environmentally friendly farming methods and we also guarantee that our products are free of pesticides. In addition, we also continue to help the people in our our agricultural areas, especially farmers, for increasing their welfare. Meanwhile, Our canning factory have complete facilities such as: in-house lab, warehouse, as well as office.